One costume change equals three days! After the tea ceremony at the groom's family home, the bride will change out of her western style wedding gown. This change of clothes symbolizes the passing of three days! 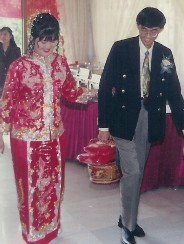 The bride may choose to change into another western dress, a cheongsam or a traditional red chinese wedding gown called kwa. The kwa is made of silk, heavily embroidered with motifs of dragon, phoenix and flowers in gold and silver threads. Although heavy due to the embroidery, it is cool and comfortable to wear. The jacket is straight cut and the straight skirt is usually elasticized at the waist. What a joy to relax in the loose cut of the Kwa for a few hours before getting back into that body hugging western style wedding gown for the wedding banquet! The bride's younger brother (or whoever is playing the role) will arrive at the groom's home with a wedding basket[花篮] filled with toiletries, perfumed oils, make-up, etc for his sister. He misses his sister and wants her to go back with him for a visit. The bridal car will fetch the bride's younger brother to the groom's home. The groom will welcome the younger brother by opening the car door for him. She is definitely not going home empty handed! The bride’s home visit is the couple’s first visit to her parent’s home as a married couple. The bride cannot go back empty handed. Other than the gifts for her parents, the couple was supposed to prepare gifts for all the elder members of the family. Nowadays, red packets are used instead. In the past, many dialect groups required the bride to return home with gifts of a pair of sugar cane, a pair of live rooster and hen for her parents. These [带路鸡] “dai lu ji” were supposed to lead the way back. In return, the bride's parents will also provide gifts of a rooster and hen. These will be put under the bridal bed back at the groom’s home. It was believed that the firstborn will be male if the rooster came out first. Over the years as standard of living improved the live chickens were replaced by other types of meat, poultry, fish and expensive dried or gourmet food items such as abalone, birdnest or sharksfin. To simplify matters most of these gifts are no longer required for modern chinese weddings or are simply replaced by red packets. 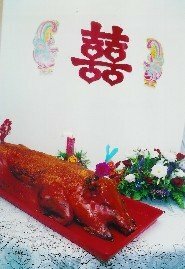 Nowadays, only symbolic items such as roast pig [烧猪] or candies are requested by brides’ parents. If one of the bride's parents is cantonese, the roast pig [烧猪] is definitely required as part of the gifts for the bride’s home visit. For non-cantonese, sometimes roast pork [烧肉] instead of a whole roast pig is requested. For teochew, two big red packets of their favorite traditional peanut and sesame candies [豆条芝麻条] “dou tiao, zi ma tiao” are usually requested. For hokkiens, combinations of popped rice blocks, or popped rice and sesame rolls, peanut chewy candies, bean paste cookies [米方麻佬贡糖豆沙饼] “ mi fang, ma lao, gong tang, dou sa bing” are usually requested. Tangerines or mandarin oranges [橘子]”Juzi” sounds like good fortune [吉] “Ji” in chinese and must be included as part of the gifts. If tangerines are out of season, oranges can be used instead. Ensure that the quantity of the items is sufficient for a portion to be returned to signify sharing of fortune between the two families. Tangerines or oranges will have to be replaced in the returned gifts. Tea ceremony during the bride's home visit. 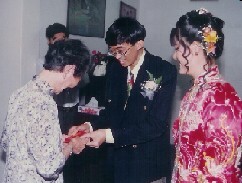 The groom is introduced to the bride's family at the tea ceremony during the bride's home visit. 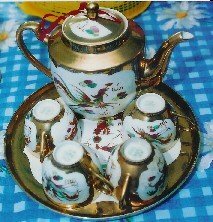 The bride's mother's wedding tea set, if available, is used for this ceremony. Otherwise, any nice tea set can be used. The order of service is the same as the tea ceremony at the groom's home. Usually the relatives of the bride will present her with jewellery rather than red packets. This is referred to as adding to her dowry [添嫁妆] “tien jia zhuang”. 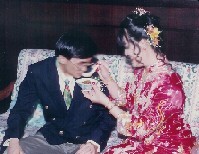 During the bride's home visit, a sweet soup with lotus seeds, dried longan, red dates and rice balls will be served to wish the couple a sweet harmonious marriage.